Finding the right lawn mower for your garden is often difficult. With so many different brands offering a variety of lawn mowers, knowing which is best suited for your garden may require a bit of research. There’s many things to consider before buying a lawn mower, with the most important being the size of your lawn. Small gardens with reasonable size lawns are much easier to find a mower for thankfully, as their smaller size means they don’t have as many requirements as larger gardens do. Other things you may want to consider is the overall power (although this is less important for small lawns), cutting width and height, power source (i.e. electric, petrol or cordless), collection box, and the overall weight of the lawn mower. 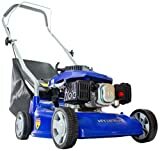 This type of lawn mower features several blades at the front, which all rotate against another series of blades fixed at the bottom, resulting in a cylinder shape device. They can be self-propelled and don’t require a motor, although petrol and electric versions are available, and are especially great at getting precise cuts. 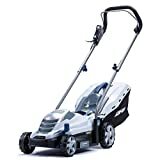 The most popular type of lawn mower and the best type for smaller gardens, they feature a single adjustable blade attached to the base of the mower, which rotates horizontally to cut the grass. They can be electric or petrol powered, and come in many sizes to suit almost every type of garden. A variation of the rotary lawn mower, these feature a blade at base of the mower much like rotary types, but they don’t have wheels on them. Instead, a small cushion of air allows the blade to hover above just above the grass, and they are often lighter and easier to move than rotary lawn mowers. Let’s take a look at some of the best lawn mowers for small gardens! The Blaupunkt GX400 is an affordable yet reliable electric lawn mower that is a great choice for smaller gardens. With a 1300W electric motor providing 3600rpm, it’s got enough power to tackle small and medium lawns without much issue. A cutting width of 33cm is perfect for most lawn shapes, and with 5 adjustable height settings you can use it year-round. This is especially useful for seasonal maintenance where you might need to take more length off during the warmer months or if your grass has grown longer than intended. This also ensures you get the desired length depending on the overall condition of the grass. Some hardier grass requires different cutting lengths, even more so when left to grow unchecked, so it’s certainly a versatile mower suited for lawns in any condition. As a corded model it comes with a 10m cable, which is more than enough to cover any small and medium sized gardens, and the ergonomically designed comfort grip makes for comfortable handling. You probably won’t need to empty it much either, as it’s got an impressive 35L grass collector that can hold all the cuttings from most small lawns! The Bosch Rotak 32R is one of the leading electric rotary lawn mowers on the market, being a firm favourite for those with small gardens. It’s compact and lightweight, making it easy to use and store, while the electric motor offers enough juice to handle gardens up to 150m2 - more than enough for any small garden! At under 7kg, it really is so simple to operate, which may be of interest to anyone that struggles to move heavier objects, while t fold-down handle design ensures the 32R takes up little space when stored away. With a 32cm cutting width, it still offers ample coverage for small lawns of every shape, while the rear roller makes creating aesthetically pleasing lawn stripes simple. The large 32L grass collector means you won’t have to empty the lawn mower frequently - you probably won’t need to empty it all when using on smaller lawns! Expect a nice and precise cut too, as the 32R features front heels and grass combs to achieve that perfect finish - this is especially great for edging around borders and paths! Best of all, the Bosch 32R comes with a very competitive price and a 2-year warranty for that additional peace of mind. Flymo are a leading manufacturer of lawn mowers in the UK, so you know there is a high standard when it comes to their products. The Chevron 34VC is no exception to this, offering one of the best lawn mowers for both small and medium size gardens. With a 1400W electric motor, this rotary lawn mower from Flymo has the power and capacity to make short work of small and medium size lawns, especially with the impressive 34cm cutting width. Better still, 5 adjustable cutting heights allows for versatile mowing throughout the year and on lawns of any condition -simply hit the level to change to the desired cutting height! Using the Chevron 34 VC couldn’t be easier either. Its designed to collect and compact grass as it cuts, and with a 40L collector capacity, you won’t need to empty it many times. In fact, there is unique vision window that lets you see exactly how full the collector is, saving you the hassle of stopping the mower just to check inside the box! The inclusion of the edging comb means you can easily get more precise cuts along hard to reach spots like along fences and paths, while the rear roller allows for attractive striped lawns to be created. All in all, a fantastic lawn mower for both small and medium gardens. It’s affordable, versatile, and easy to use - everything you want from a lawn mower! If you have a small garden with a lawn that’s on the wilder side, then the VonHaus 1800W lawnmower is a fantastic option. An incredibly powerful rotary lawn mower, it will not struggle to cut lawns regardless of their length and overall condition. This is thanks to the incredible 1800W electric motor producing 3400rpm and an impressive 43cm cutting width. Both these features allow the lawn mower to cut most small and medium size lawns with the upmost east, regardless of grass length. Should you need to cut grass of varying heights - which tends to happen with year-round mowing - simply flip the switch to go between one of six cutting heights. These range from 2.5cm to 7.2cm, so there is certainly no shortage of options when it comes to cutting heights! Better still, the VonHaus 1800W lawnmower is easy to control despite its power. The total weight is only 13.5kg, so it won’t feel strenuous when trying to operate the mower, and the 10m cable ensures plenty of room for manoeuvring. For anyone with a lawn that takes a bit more effort to maintain, this option from VonHaus is certainly worth consideration! Sick of battling with cords any time you use your lawn mower? Then a cordless option like the Bosch Rotak 32 Ergoflex is certainly worth looking at! The main selling point of this lawn mower is the fact it’s cordless. This feature removes the hassle of constantly dealing with the cord - and making sure you don’t run over it - with the 36V Lithium-ion battery offering enough power to mow small gardens on a single charge. A comfortable ergoflex handle also ensures operating the mower is simple enough, ensuring your posture remains correct and helping to reduce strain when in use. The handle also includes a button to adjust the cutting heights as needed, ranging from 30mm to 70mm. Also, the Bosch Rotak 32 Ergoflex provides some of the most precise finishes out there. The front heels and grass combes produce a highly detailed finish around borders and flower beds, while the integrated rear roller can be used to create a lovely striped finish. Furthermore, the lawn mower comes with a 2-year warranty, which can even be extended by a further by simply registering the product on the Bosch website - talk about a great deal! The one area where petrol lawn mowers, such as the HYM40P from Hyundai, excels are power. Simply put, petrol lawn mowers are incredibly powerful so can make easy work of virtually any garden lawn. Featuring a 99cc four-stroke petrol engine and 40cm cutting width, the HYM40P is suitable for any small or medium size gardens, especially those that are in less than ideal conditions. Despite the petrol engine, the lawn mower is surprisingly quiet and doesn’t consume much petrol, helping to keep running costs relatively low. To start the HYM40P, you can either kneel and pull on the cord directly, or simply use the connected lever on the handle and remain upright. There is a total of three cutting heights that range from 2.5cm to 7.5cm, so you can get suitable cuts for both long and short lawns. Weighing only 18.5kg, it is quite light for a petrol lawn mower, so operating it in small or medium size gardens shouldn’t be too strenuous. Comfort grip handles also help to reduce fatigue, while the spacious 40L grass collector can hold the cuttings of small gardens without the need to empty.